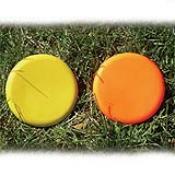 Flag Football Ball Spotter, Yellow or Orange - WIND PROOF! Yellow or Orange... wind proof-weighted flag football - ball spotters are used to mark the original line of scrimmage and/or ball placement. This item is sold as a single piece (each).